The new contract offers more pay, more job security, and more work for CWA members. As we see AT&T's non-union competition eliminate thousands of jobs, close a dozen call centers, and cut back on pay, we are fighting back against these headwinds for real improvements in the wireless industry. What is the CWA Members Relief Fund? It is a fund that provides assistance to members and agency fee payers during sanctioned strikes. It is funded by ¼ hour of basic wages per month per member or agency fee payer eligible to strike. How do I get striker benefits? Strikers are required to perform strike duty. The Local determines the amount of strike duty. Strike assignments may include, but are not limited to: picket duty, phone duty, email duty, etc. If you have a medical condition or problem that would prevent you from walking a picket line, we can assign your duties. Before any strike benefits are paid a Striker Certification Form must be filled out and on file at the Local office. What are the weekly benefits to strikers? The CWA Members Relief Fund provides striker a strike benefit of $200 per week beginning with the 15th day of the strike, $300 per week beginning with the 29th day of the strike, and $400 beginning on the 57th day of the strike. Are weekly strike benefits taxed? Strike benefits are taxed similar to the way interest on a savings account is taxed. If you receive over $600 in strike benefits in one year, the Local will send you a 1099 Form. If you have any questions, please contact the local office at (217)892-8700. If you haven't already done so, please fill out the striker certification form and email it to treasurer@cwa4202.org or fax it to (217)892-5558. A scab is someone who crosses a picket line and decides not to fight alongside her brothers and sisters. 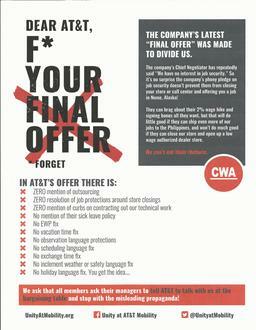 Scabs make it easier for AT&T to lower wages and benefits. Anyone who scabs should think about how she is selling out her coworkers for some short term crumbs from the company. But I have a family to support. I can’t afford to strike. Striking is hard for everyone. There will be 21 thousand members across the country, many single moms with kids, who will be doing the right thing and striking if and when the time comes. Everyone is in the same boat. CWA has a multi-million dollar Strike Fund. We are a family, and we will take care of each other. Did anyone lose their home or car during last year’s Verizon strike? No. In addition to the normal strike checks members will receive if the strike lasts longer than 14 days, CWA has special funds available to pay for members who face financial emergencies during any strike. CWA paid mortgage and rent and car payments for many members who could prove that they could not afford to cover such bills during the strike. During the 49 day Verizon strike, not a single member lost his home, or car. Not a single member was denied necessary medical care for themselves or families. Can I get absence points or get fired during the strike? No. Striking is a legally protected activity, and anyone on strike will not get any points or be disciplined or terminated for striking. Is it legal for managers to ask me if I will strike? No. This is an Unfair Labor Practice, and a violation of Federal Law. What if a strike falls during my vacation? Members who are on an approved vacation during a strike will get paid by the company, as usual. What did we learn during the Verizon strike? We learned that customers are enormously sympathetic to labor issues these days. During the Verizon strike last year, most customers honored our picket lines. This caused the company to lose millions in revenue, which ultimately helped the union win the strike. We also learned that Verizon retail workers especially hardly made any money in empty stores. We encourage people to ask their grandparents why they shouldn’t scab. The union movement and indeed the middle class was built by workers in previous generations rising to the challenge during past labor disputes. Do you have what it takes to follow in your grandparent’s steps and fight back? A scab is a two-legged animal with a cork-screw soul, a water-logged brain, a combination backbone of jelly and glue. Where others have hearts, he carries a tumor of rotten principles. When a scab comes down the street, men turn their backs and angels weep in heaven, and the Devil shuts the gates of Hell to keep him out. No man has a right to scab so long as there is a pool of water to drown his carcass in, or a rope long enough to hang his body with. Judas Iscariot was a gentleman compared with a scab. For betraying his master, he had character enough to hang himself. A scab has not. In today’s fake NEWS NOW, they said “if a call center or retail store closing results in a surplus, employees will be guaranteed a job offer in our Mobility business”. The truth is the job literally can be anywhere in the country. There is no limit on distance. If you work in a Call Center where multiple job duties are performed, and specific functions of that Call Center are outsourced that result in a surplus of any title and the Center remains open, then no one is protected under this proposal. If the company decides to surplus the Sales Support Representative (SSR) title, and the store remains open, no one is protected in their proposal. If you are lucky to receive a job offer, they will give you 1 day to decide if you want to accept the offer or it will be considered you rejected the offer. While today’s email states that their offer means “employees will be guaranteed a job offer;” the real truth is the proposal says: “If a job offer is not made within 6 months from the date the employee is notified of the surplus, the employee will continue under the terms of Article 14, Force Adjustment,” which means if they don’t have a job to offer you within 6 months, you take your severance and leave. This is not a guaranteed job. They also have a section in there that says that the company retains the right in its sole discretion to cancel or suspend employment security commitment at any time due to business conditions. The Company has been posting misinformation to you since they decided to send out their ridiculous “final offer”. The more we discuss their final offer, the more misinformation we uncover. Your Bargaining Team has conveyed our disgust to the company over their actions, and it is comforting to see our membership standing united and not falling for their propaganda. Talks continued this week and the Union passed our full counter proposal to the company that includes all those issues you’ve identified as a priority in this round of bargaining. The Company continues to reject proposals surrounding flexible EWP time, a fair absence plan, real job security, new work for technicians, call sharing language that would protect call center workers, language securing retail jobs and addressing the issues facing our supply/warehouse members. Rather than share their enormous profits with the workers that make them profitable, the Company would rather mislead their employees and try to convince them that less is more. Discussions at the table are scheduled to continue throughout the weekend. We are here fighting and we need you to be mobilized and angry in the workplace. Stay strong Brothers and Sisters. When We fight, We Win! had record numbers of members join this call and stay with us for a lively Q&A session. President Dennis Trainor, the bargaining committee, and mobilizers answer questions. Local leaders for the most up to date information on bargaining and mobilization. this, AT&T is extending your opportunity to enroll and correct any error by two weeks. Thanks to all of you who reported problems with the open enrollment. Call Centers. We will revisit this next week when bargaining reconvenes. not exactly fake news, it is misleading and aimed at dividing our membership. the next four years. AT&T needs to be more forthcoming with the truth. Act and we anticipate we will hear back from the Labor Board soon. while we work on issues other than wages and benefits, such as working conditions. Call Centers, we were finally joined by Bradley Petrick, the AVP over ATS call centers. enlightening, did not resemble in any way what you have told us actually occurs. bargaining chair is cleared to travel soon. Thursday evening, October 19th. We look forward to hearing from you. Note: You cannot be disciplined for following management's rules. In fact, you can be disciplined for NOT following management's rules. So, if any manager complains that your work-output is too slow as a result of following their rules, ask them to put in writing which step you should skip. Unless you get something in writing from your boss, be sure to follow all their rules, even if your manager complains that things are taking too long. What is “Skip No Steps”? Skip No Steps is a reminder that all members should follow all work rules from management. Why should we do “Skip No Steps” now? While we are working without a contract, members do not have arbitration rights. Even though we still have the right to the grievance process, this lack of arbitration rights can potentially put members in increased jeopardy, especially while we are coming up on a busy sales season. One way to mitigate this risk it to make sure we are all following the rules the company has laid out for us. Is this designed to slow down our work? No. Skip No Steps is designed to protect our members during this stressful period when we don’t have arbitration rights. I am a technician. Is there a specific example of a rule I should be following. Technicians should follow all rules imposed by management. Follow the MOP (Method of Procedure). One important example is the Vehicle Safety Check and Safety Exercises. AT&T mandates that all members do an exhaustive safety check of our vehicles before each tour, and do stretches and exercise to lower the risk of injury (Pre-Driving Vehicle Inspection). Be sure to do this comprehensive safety check and exercise/stretching as per the guidelines. I work as a Retail worker. Is there a specific example of a rule I should be following? Retail workers should follow all rules imposed by management. Make certain you follow the “5 Key Behaviors,” and give the entire “Customer Experience” to all customers. This means making sure to check over customers’ bills for overages, data, and be sure to follow the CPNI Rule for all customers, etc. I work at a Call Center. Is there a specific example of a rule I should be following? Call center workers should follow all rules imposed by management. Be sure to follow My CSP procedures for all calls; be sure to follow “5 key behaviors,” including greetings, planting of the seeds, etc. Be sure to have all your tools at the ready, including MyCSP, OPUS, Clarify, Zone, and Snapshot. Following management’s rules sometimes slows us down. Can I be legally disciplined for following all these rules? No. Members can be disciplined for NOT following the rules imposed by management. Remember, during this stressful time, we want to make sure our members are protected. Therefore, be sure to follow all rules from management. your continued commitment, Unity and support during this long round of bargaining. Be prepared for stepped up mobilization in the coming weeks. We have all been waiting with increasing frustration for AT&T to move towards us at the bargaining table. Despite enormous profits and a successful second quarter, AT&T wants to weaken our job security, close our stores, and offshore our work. They have a plan to turn good union jobs into unstable, low-wage jobs. August 15th - call with Mobilizers throughout the “Orange” footprint to discuss this plan. Mobilizers will receive an email with more information about the call. August 21st - mass Town Hall Call with all members. The call will take place at 8:30pm ET, 7:30pm CT, 6:30pm MT, 5:30pm PT. Text the word MobilityCall to 69866 to RSVP. On these calls we will update everyone on bargaining, discuss the many Unfair Labor Practice charges we have filed with the Labor Board, give advice on how to lower the risk of unfair discipline during bargaining, and discuss what may happen in the coming weeks. Bargaining is dragging on for too long. But we would rather get a fair contract than a quick contract. Dr. Martin Luther King, Jr. said “The Arc of the moral universe is long, but it bends towards justice.” Brothers and sisters, lets join together to ensure that our fight with AT&T bends us towards justice! bargained sales jobs. These jobs known as Integrated Sales Consultants are being used to up sell customers right in their homes after online sales or a DTV installation and a support job called Integrated Sales Support Specialist that is equivalent to our SSRs. We made it clear to the company that they are doing bargained for work and this must stop immediately. We are intent on getting job security and jobs for the future. We also pressured the company to supply the information we requested for small cells and the first responder network. The Company’s greed is on full display when the discussions turn to absence. They treat talks about absence with disdain and want to roll back protections for their employees who get sick. We will continue to fight for fair benefits that protect you when you and your family are not well. Along with the NLRB charges, the Union is currently investigating the following situations: changes in schedules for part timers; changes in the goals under the commission plans; soliciting employees to resign from the Union; and threats and retaliation following the strike. Each District will be filing charges associated with the above as needed. We know that this can be a long and frustrating process, but we are committed to fighting as long as it takes to get a fair contract. We need mobilization to continue, please stay in touch with your Local for upcoming mobilization activities. When we fight, we WIN! As the dust is settling on our historic strike, some things are coming into view clearly. It is crystal clear that management was absolutely stunned that so many people went on strike to demand a fair contract (special props to our great mobilizers and picket captains who did great work maintaining those picket line). AT&T underestimated the anger we all feel as our commissions checks have declined, as our jobs have become more insecure, and as more and more work is being offshored. We have every reason to be angry, especially as the top executives give themselves huge pay increases at our expense. We have clear plan to negotiate a contract we can all be proud of. The company now knows we are capable of launching an effective strike. It is dawning on them that their arrogance is now coming back to haunt them. Our lawyers have been filing many Unfair Labor Practice Charges (ULPs) against the company at the National Labor Relations Board. We have accused the company of failing to provide necessary information to the union during bargaining, of making illegal threats to members during and after the strike, and perhaps most important, we have filed a ULP because management has unilaterally changed our commissions without bargaining. And the last point is critical. It is illegal for AT&T to make any changes unilaterally to any of our "terms or conditions" of employment without bargaining. In many ways, this puts us in the driver’s seat during this period. Do you have any concerns or management harassment to report? Click here to fill out the confidential form. Each day that passes, it is harder and harder for the company to operate in this ever-changing industry without having the ability to make certain changes. And so as we bargain, time is on OUR side. Each day without a contract brings more pressure on the company. In addition, we are waiting for all the ULP charges to be investigated by the labor board. Once they conclude the investigation, we believe complaints will be issued by the government against AT&T. Again, more pressure. And of course, nothing prevents us from calling another strike. More pressure. Management knows all this, and they have tried desperately to break our unity; recently, they have encouraged people to resign from the union. And you know what happened after they starting this campaign? We saw something unprecedented: Right after the strike, more and more Mobility employees have joined the union instead! We will soon be announcing more mobilizing activities which will further pressure this greedy company to begin bargaining fairly. Keep in close contact with your mobilizers, your stewards, picket captains, and local officers. Getting any contract is easy. Getting a contract we deserve will take unity and mobilization. Keep up the great work, and know that we have a plan, we are following the plan, and the company must come to their senses and begin to address our issues at the bargaining table. Tomorrow at 3 PM Eastern Time, CWA will be on strike against AT&T’s corporate greed unless there is significant movement between now and then. Stay in touch with your Local for additional details. We will walk out with our heads held high and fight for the fair contract we deserve. This is a historic moment for mobility workers covered by the Orange Contract. CWA has a long history of fighting for good American jobs and tomorrow the fight continues. The Bargaining Team thanks you for your support throughout this process and we will continue bargaining after the strike for as long as it takes to get a fair and equitable contract. When we fight we WIN, One day longer, One day stronger! If there is any intimidation, retaliation, discipline or encouragement to leave the Union, you need to report it immediately to your Local. Just because the strike is over doesn’t mean the fight is over. The strike has unified the members like never before and that should carry over into your respective work areas. Mobilization must continue, so we can show this company that this will not end until we get a fair and equitable contract. This is a fight for good American jobs and when We Fight We Win! NATIONWIDE – As AT&T workers refuse to back down from their demands that the company end offshoring and outsourcing, wireless, wireline and DirecTV workers across the country announced they will unite their fights for good jobs. For AT&T, that means more than 38,000 workers nationwide are together calling on the company to invest in its core workforce that helps it bring in over $1 billion a month in profits. Under a contract extension that can be terminated with 72 hours’ notice, workers will continue to bargain with the expectation that AT&T executives will come to the table with good faith proposals that protect family-supporting American jobs and invest in the country where customers have made the company a $250 billion telecom giant. After AT&T wireless workers voted by a 93 percent margin to authorize a strike if it becomes necessary, hundreds of retail and call center workers and field technicians joined rallies outside stores and call centers in 36 cities this weekend. In cities from New York to Chicago to Sacramento, AT&T workers called on the company to support their workforce with a fair contract that ends offshoring and outsourcing and supports high quality customer service. While AT&T’s profits keep growing, it has cut more than 8,000 call center jobs and offshored thousands of jobs to Mexico, the Philippines, India, the Dominican Republic and other countries. In the past few years, AT&T has also outsourced the operation of more than 60% of its wireless retail stores to low-wage, low-quality 3rd party dealers. Outraged at AT&T’s decisions and latest contract proposals, members of Congress are calling on company executives to support good, middle-class jobs. Recently, seven U.S. Senators sent a letter to President Trump encouraging the Trump Administration to take action to help protect and bring call center jobs back to the U.S.
More than 17,000 workers in California and Nevada who support landline phone and broadband internet have been working without a contract for nearly one year. After voting to go on strike with more than 95 percent support, AT&T wireline workers have gathered at major state freeway overpasses to protest the company’s ongoing attempts to squeeze customers and employees. Last year, CWA members at Verizon were on strike for 49 days, finally gaining a strong contract that created and protected good jobs. During the strike, Verizon’s approval ratings were at a three-year low while analysts and media regularly remarked on the reputational damage facing Verizon. The company made some proposals regarding the grievance and arbitration procedure but these proposals only gave rise to mor...e questions and information requests from the bargaining team.